Kerensa and I took a quick jaunt to Wichita, Kansas last weekend for a wedding. 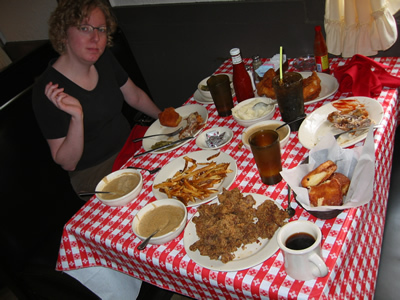 We flew to Kansas City and rented a car there, an arrangement which offers the double advantage of being $100 cheaper per person, and offering two opportunities to visit foodie shrines in the ancestral home of Calvin Trillin. On past trips we've hit Arthur Bryants, Winsteads, LC's, and others. It's always delicious; this trip was no exception. 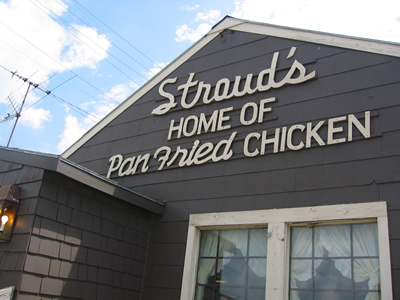 There has been some recent discussion of whether or not Stroud's is worth a visit: my one time eating chicken there before was great, and this recent visit confirmed it for me. 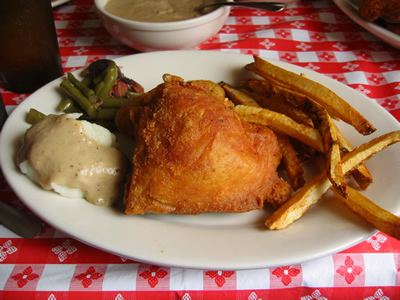 Stroud's is excellent, I am incapable of expressing lukewarm feelings about their hot fried fowl. We started with gizzards and livers. 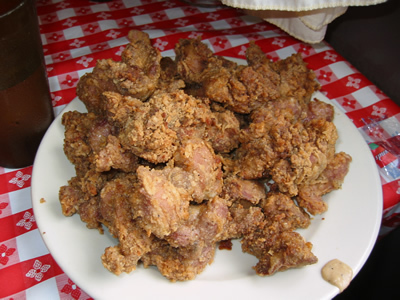 Below are pictured the "half" order or mixed up innards, $4.50 of snappy springy gizzards and crumbly rich fried liver, far more than any two city sophisticates could eat in a single sitting. 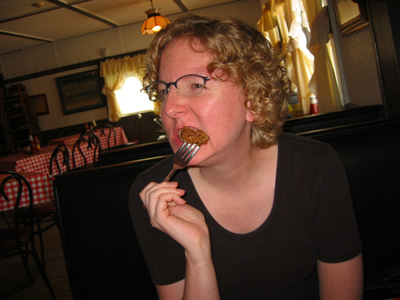 Kerensa did better than I did: I got gizzard fatigue after three or four bites, but she was up for the battle and tenacious. Then the chicken, fresh from the skillet, with brittling crackling skin in a very light crust, bursting with juices and semi rendered shmaltz. 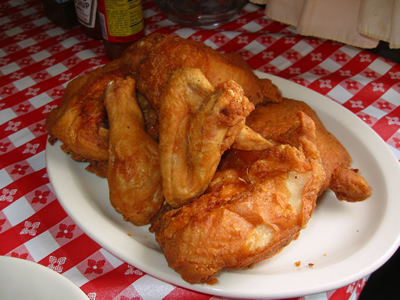 The thigh was extravagantly greasy, the wing as tasty as a porkrind. I didn't even crack the breast, but I'm sure it too was tasty. You also get long-cooked green beans inpotlikker with large hacked pieces of ham, more gravy than you'd think you'd need (and you'd be right). We chose mashed potatoes and french fries for our potatoes, passing up the pile of cottage fries to rival Gene and Georetti's. The fried were excellent, just a notch below Arthur Bryant's lardy potato masterpieces. Also pictured below are the hot buttered cinnamon rolls, crusted with sugar and soaked in butter, delicious, but completely unnecessary. So, I like Stroud's, and think that it's well worth a visit. business too carefully. 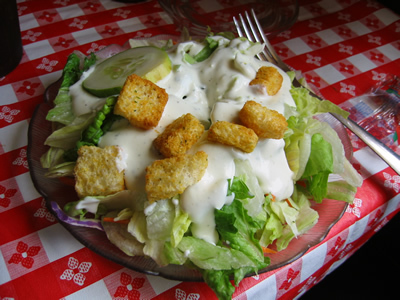 A call to Rosedale netted us the info that we were on the wrong side of the Kansas/Missouri border, so we went looking for Fiorella's Jack Stack, a restaurant my father has been prodding me to try ever since I started flying into Kansas City on a regular basis. 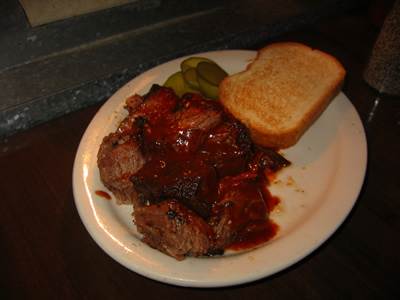 There were especially appetizing reports of good lamb ribs, which I haven't had an exemplary version of since 1999, when I ate lamb ribs and brisket at Bob's Smokehouse in San Antonio and realized that my grandmother's brisket potroast, though delicious, couldn't stand up to the Texas Smoke Standard. Anyhow, the downtown fiorella's is in a converted train station, next to Lidia Bastianich's Kansas City outpost. It is not a place that inspires great BBQ expectations at first glance. It is in a beautiful room with exposed beams, and sunlight streaming in from high up windows. The tables are cast in faux adobo, the waitstaff outfitted in identical tidy uniforms, and each place setting graced with a folded linen napkin and a container of Jack Stack Brand BBQ Rub, ingredients including dehydrated onion, garlic, bell pepper, salt, MSG and pepper. Each table tent lets you know that you can order fiorella's bbq online for delivery anywhere that fed ex delivers. As someone who has long subscribed to Calvin Trillin's proposition that BBQ quality is inversely related to the solidity of the table settings, I did not have very high hopes. We started with a plate of brisket burnt ends, hunks of smoked meat, with some char attached, occasionally tough and chewy, but mostly tasty. There were three sauces, all ketchupy. The hottest "fire" version was the best, but none were all that good. 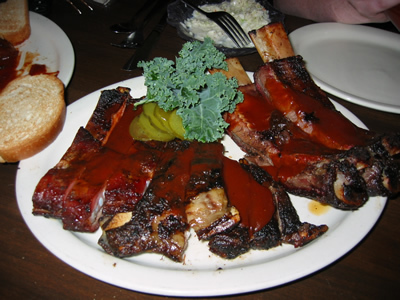 Then ribs: we split a plate of all three kinds, beef, port spareribs, and lamb. These ribs were much better than I would've expected, but not perfect. The texture was good, the lamb ribs were especially smoky, and the beef ribs fell apart at the touch. There was no trace of meat jello in the spare ribs, but also not as much in the way of char and fat as I like in a spare. But all were very good. Not as good as Arthur Bryantsm but still worth a try and better than most you'll find in restaurants in Chicago. Seth Zurer wrote: Also pictured below are the hot buttered cinnamon rolls, crusted with sugar and soaked in butter, delicious, but completely unnecessary. 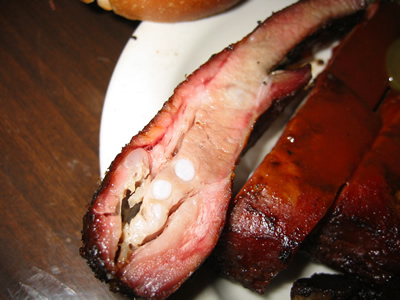 Did you happen to see or try any of the smoked beef shortribs at Fiorella Jack's? I've always been curious about those. Steve, I didn't see any shortribs, so didn't try them, but they sounds good.